This will be a short post merely highlighting the latest updates to Cydia Substrate and Pangu Release which is GREAT news for those who took the leap and updated and have jailbroken their devices on iOS 8. The first crucial update comes from the Pangue team who released an update to their untethered jailbreak. The update was aimed to address issues with Cydia Substrate loading issue upon reboot, iMessage picture sending, lost photos from camera roll during jailbreak, and Safari bugs. Personally, being one of the first users to test upgrading to iOS8 and the Pangu jailbreak, faced three of the issues previously mentioned so this update so I was very happy to hear that the Pangu team had worked very hard to resolve them. 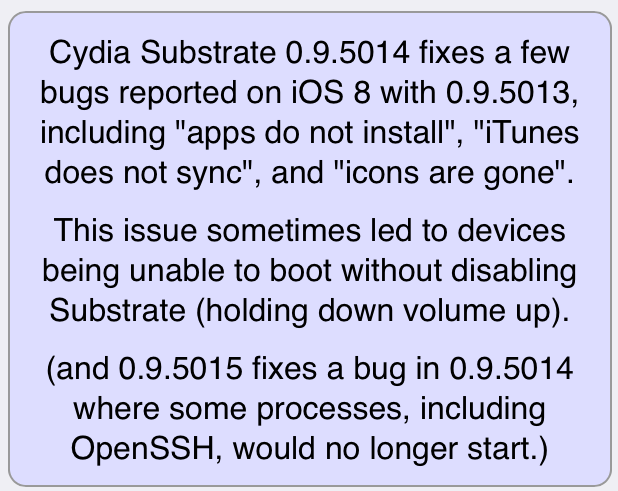 Regarding the Cydia Substrate loading issue, users who were jailbroken required to respring their devices after every reboot or power off and power on. However, that will not be an issue anymore as the Pangu team have updated their release to allow the Cydia Substrate to load early on during the booting process cancelling the need for the respring. Please find the screenshot below highlighting the release update. In my opinion, which you are free to object to, this means iOS 8 jailbreak one step closer to full stability and has taken a huge leap since the pangue jaibreak tool was first released. We should expect a final version sooner rather than later that could be rolled out to most if not all devices that are still stuck in the 7.x world. The second update concerns the Cydia Substrate released by saurik to address users facing app installation not working, iTunes syncing errors, and jailbreak icons disappearing as well as newer ones not showing up post-install. Do these updates make you feel more comfortable regarding the iOS 8 update? Have you faced any of the issues mentioned above and now excited that they have been finally resolved? This entry was posted in Apple, Cydia, iPad, Jailbreak and tagged cydia, Cydia Substrate, iOS 8, jailbreak, Pangu, Saurik. Bookmark the permalink. My advice don’t upgrade yet to iOS 8 if you think it’s jailbroken , still a lot if bugs and issues… Wait a while and things will be clear. Agreed, those users still on iOS 7.x should definetely stay the way they are. Those who are already on iOS 8 and are adventurous can have a go at it. The journey to a stable version of jailbreak and compatible tweak is still long but this post should inspire hope that jailbreaking is not dead despite the evad3rs slowly fading out of the picture and into the shadows. All thanks to the people like Saurik, Ryan Petrick, and the Pangu team working day and night on making the jailbreak experience an enjoyable one. Be sure to stay tuned for upcoming jailbreak and other exciting news concerning iOS 8.